As of this article’s publishing there’s a mere 48 hours left to get in at the ground level of action science history. Atomic Robo is the synthetic intelligence in a ruggedly handsome robotic chassis created by Nikola Tesla, and Atomic Robo is the comic book about him, created by Brian Clevinger and Scott Wegener. Since robots can’t die in a conventional sense, Robo has been around since the 1920s and each volume of his 100% historically accurate funnybook takes place in different eras. Read ’em in any order! The series is beloved by legions of fans and well-known comic creators alike. If you haven’t, you should totally read it! 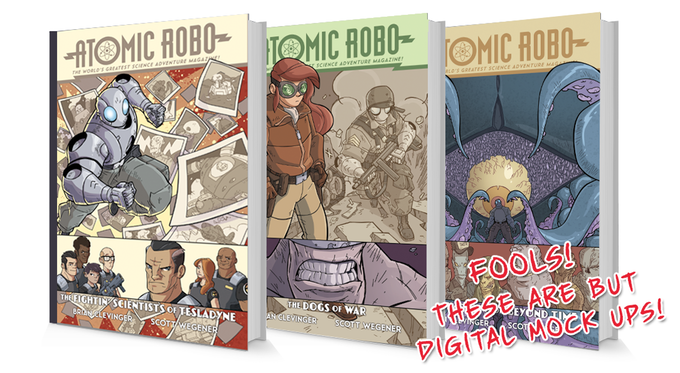 You don’t even have to pay money to do it – the Atomic Robo recently reinvented itself as a webcomic, and all past volumes are free to read at Atomic-Robo.com! It also features a criminally insane talking dinosaur. 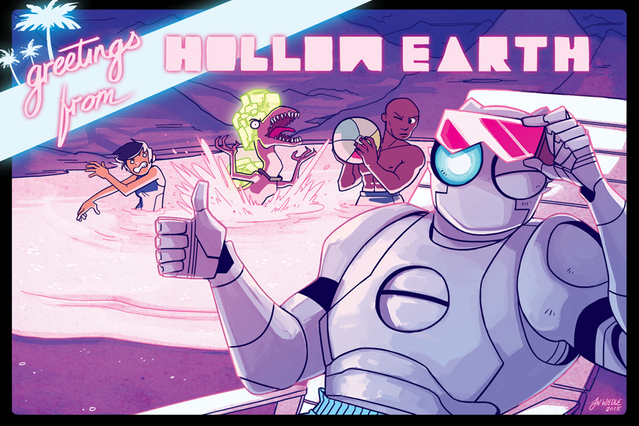 Recently, Team Robo launched a Kickstarter just to get the books printed in glorious hardcover special editions, and now they’re nearly $78,000 over funded. Yes, the books are a sure thing – and you could get in on the ground floor at a discounted rate before they hit store shelves. But that’s not all – with all this surplus cash to go around, Team Robo is on a quest for all new content and even some philanthropy. The series is all ages, full of action and wonder; beloved by adults and kids alike. It’s only right that it be found in libraries. Now, thanks to the Kickstarter stretch goals, at least 200 books are going to libraries. Plus there’s more Robo tales to go around. Real Science Adventures is a spin-off series that tackles further stories from the Robo universe; both expanding on Robo’s backstory as well as exploring further tales with supporting characters. Thanks to Kickstarter, not only is a new volume of RSA is on the way, but another is close at hand and the focus of this second book will be chosen by backers! The Hardcover Volumes: All 9 volumes. Remastered, relettered, on heavy paper with embossed covers, foil stamps, color end sheets, and even a signature or several if your money’s good. Plus bonus content including over 8 pages of all new excerpts from Dr. Dinosaur’s Dossier. 2 New Volumes of Real Science Adventures: (Okay, maybe just one as of this article’s publication – but it’s so close!) All posted free to read at Atomic-Robo.com, with backers getting PDFs. Exclusive Extras: Stickers, wallpapers, postcards – All with exclusive art. So… here’s that Kickstarter link again. The series has always been a creator-owned, independent darling that went against the grain with the kinds of stories larger comics companies wouldn’t consent to tell. Thanks to fan support it’s a tremendous success and now that it’s fully self-published is doing bigger, bolder things than it ever. Any hesitation on this incredible chance to get in on these awesome new printings are a sure sign of mammalian weakness. Just sayin’. But hey, these big ol’ books are expensive. 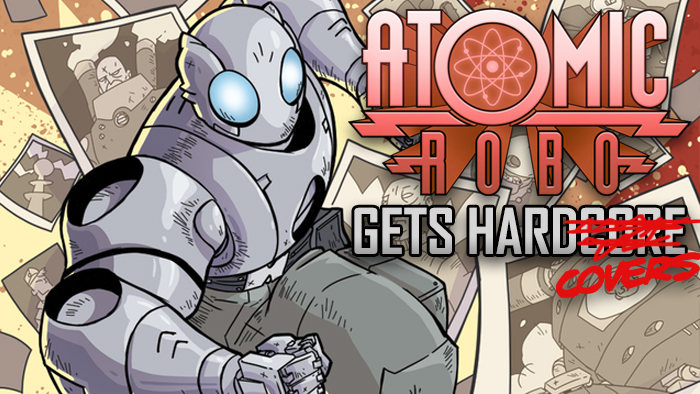 If you want to support the cause for cheaper, you can always support the Atomic Robo Patreon. And, if you’re feeling extra fliffy, there’s always the Nerdy Show Network Patreon where our next milestone secures the permanent return of Atomic Robo: Nuts & Bolts, our behind the scenes issue-by-issue podcast with Brian and Scott.